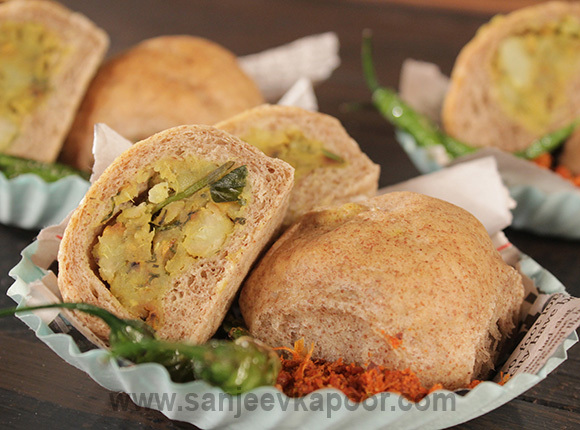 This snack has the vadas stuffed into the pavs and baked. Take yeast in a bowl. Add water and castor sugar, mix and set aside to activate. Mix together finger millet flour, soya flour and refined flour in a bowl. Add the activated yeast and 1 tablespoon oil and mix. Add sufficient water and knead into a soft dough. Set aside to rest. Heat remaining oil in a non-stick pan. Add mustard seeds and let them splutter. Add green chillies, garlic and curry leaves, mix and sauté for 30 seconds. Add turmeric powder and mix. Add sweet potatoes, raw bananas and some water and mix. Add salt and coriander leaves and mix well. Remove from heat and set aside. Dust the worktop with some flour. Place the dough on it and knock back to release the excess air. Divide the dough into equal portions, make a cavity in each portion and stuff with the cooked mixture in it. Seal and shape into pavs. Grease an aluminium tray with some oil, dust with some flour and place the prepared pavs in it. Cover and set aside to prove for 10-15 minutes. Put the tray in the preheated oven and bake for 12-15 minutes. Remove from oven and brush with the pavs with some olive oil. Serve hot with fried green chillies and garlic-chilli chutney.